Beginning of my Evening Star quilt top! 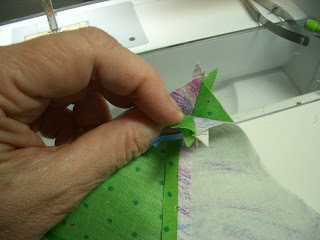 The following instructions will make a 15 1/2" finished block, depending on the accuracy of your 1/4" seam allowance. 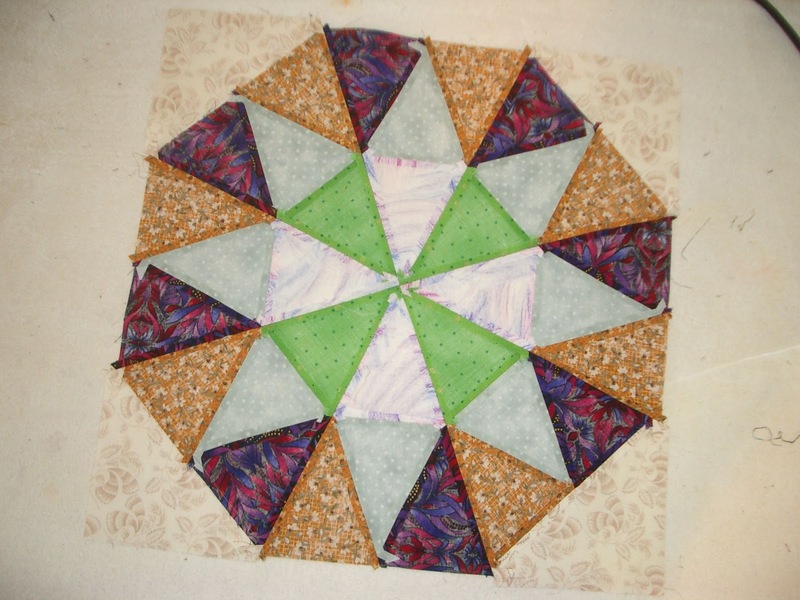 Because of how many seams are in the block, your block size may vary slightly from my measurement. First, prepare your ruler. 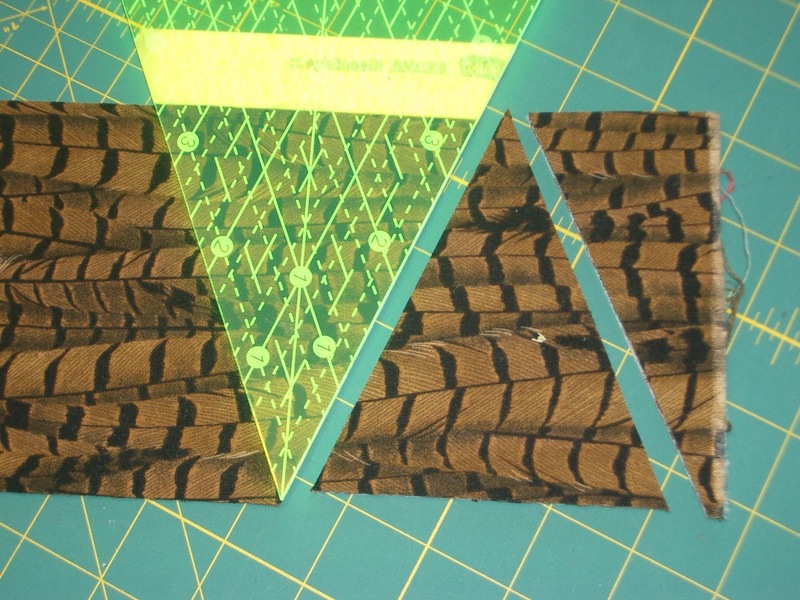 Cut 5 or 6 pieces of masking tape about 4" long and affix them to the ruler at exactly 4 3/4" from the tip of the ruler, making sure that the tape is straight across the ruler. 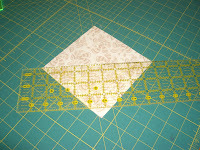 Next, cut fabric strips 4 3/4" x 18" (across the width of a fat quarter). 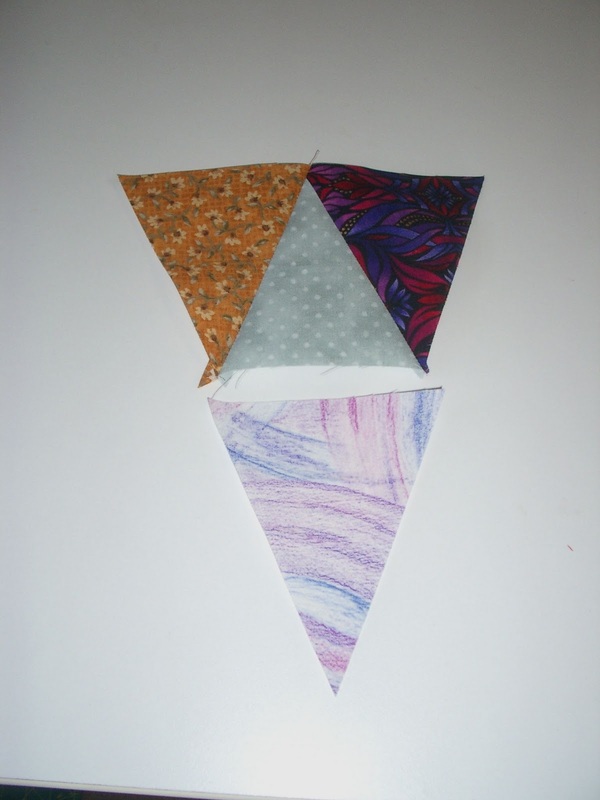 Each strip will yield 8 triangles. I like to layer 4 to 6 fat quarters of fabric on my ironing board, add a little starch/water mixture to the layers, and press them dry. 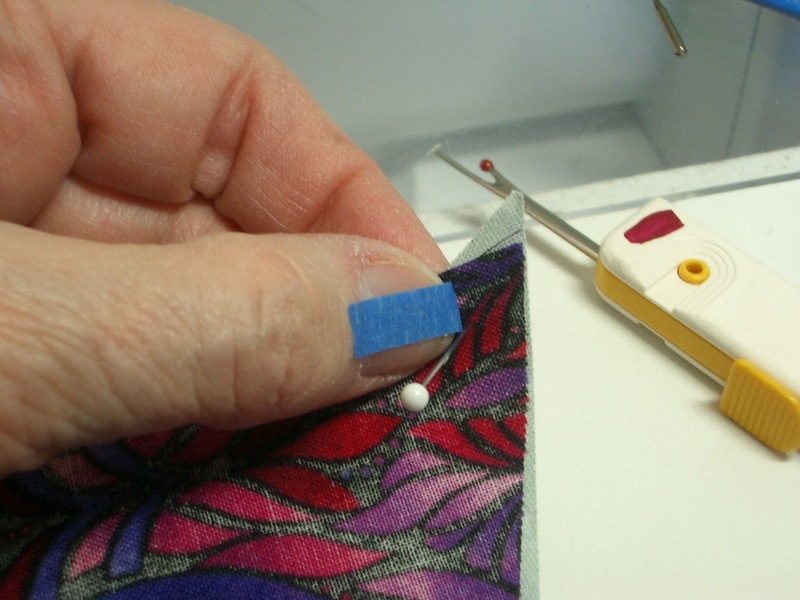 The starch serves to stick the layers together, and will hold them well for rotary cutting. I can cut pieces for 2 or more blocks at one time when layered like this. Use tape on ruler as a guide to cut first triangle. 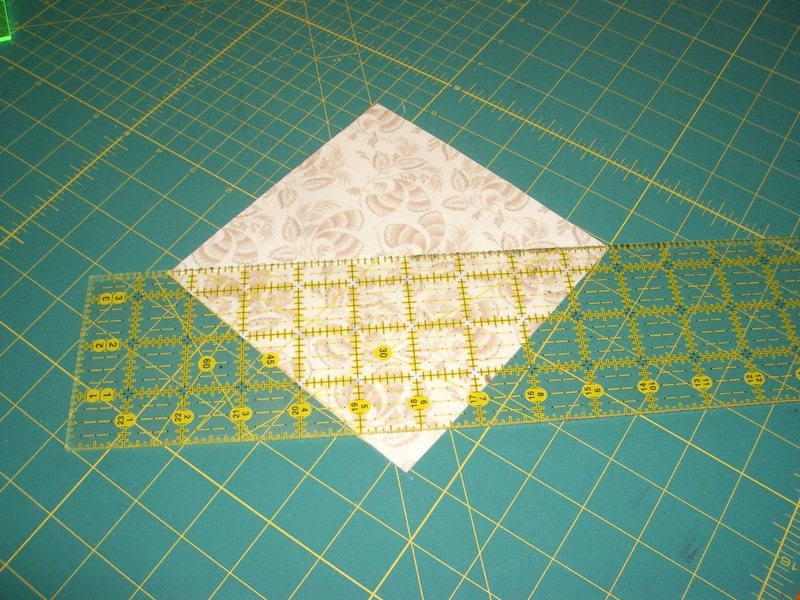 Align the tape cutting guide on the prepared ruler along one long cut edge of the 4 3/4" x 18" fabric strip. 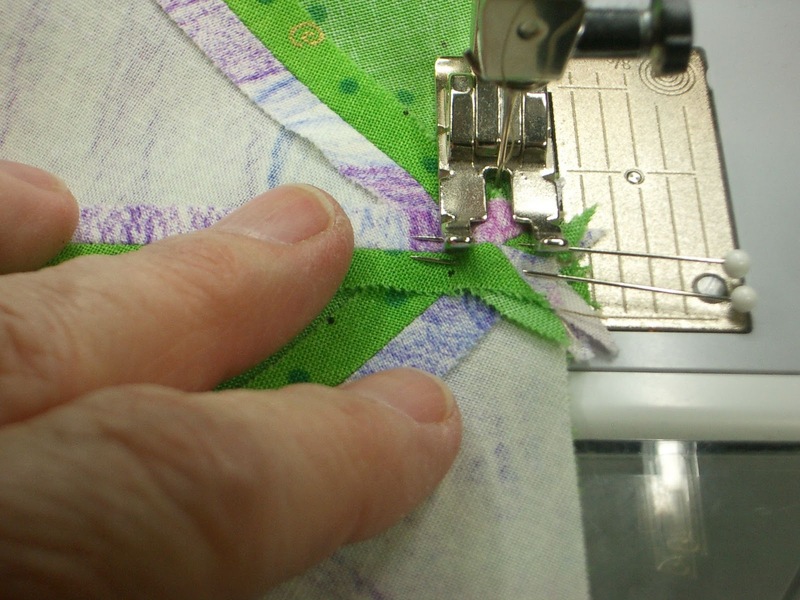 Using a rotary cutter, cut along both angled edges of the ruler. 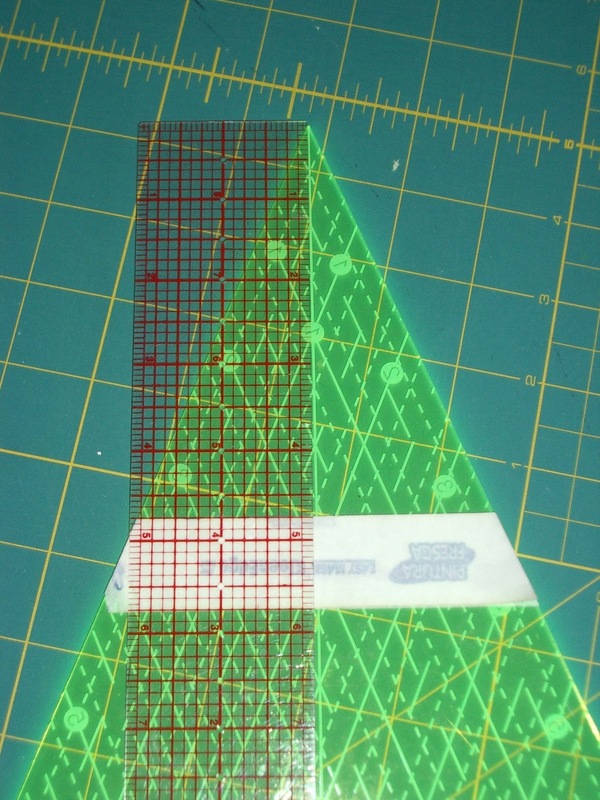 Rotate the ruler 180° and cut the next triangle. Continue rotating and cutting pieces across the strip. You should be able to get 8 sets of triangles across the strip. 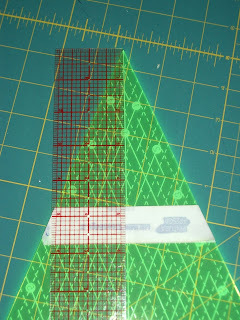 Continue cutting triangles by rotating the ruler. 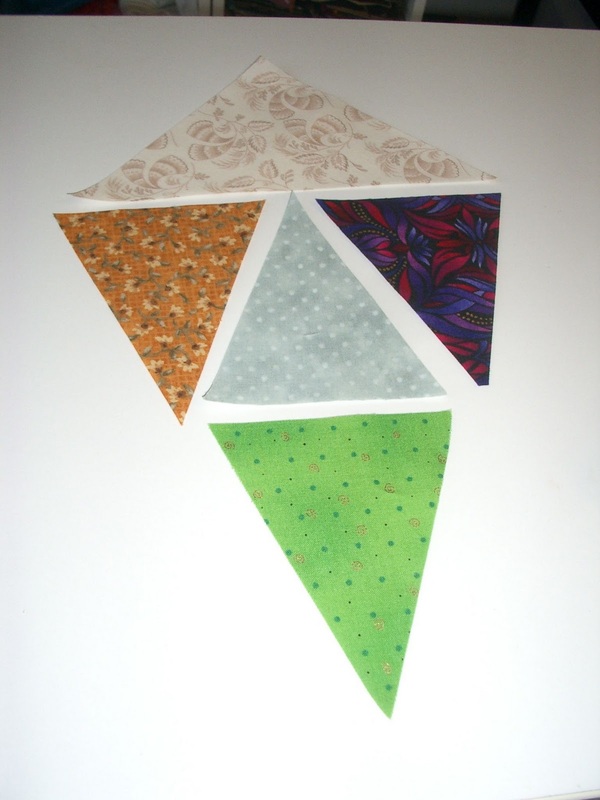 Now, arrange the triangles in 2 groups of larger triangles, as shown, with 4 triangles in each stack of triangles. Set one group aside. Arrange triangles in 2 sets of 4, with 4 deep. Set one group aside. 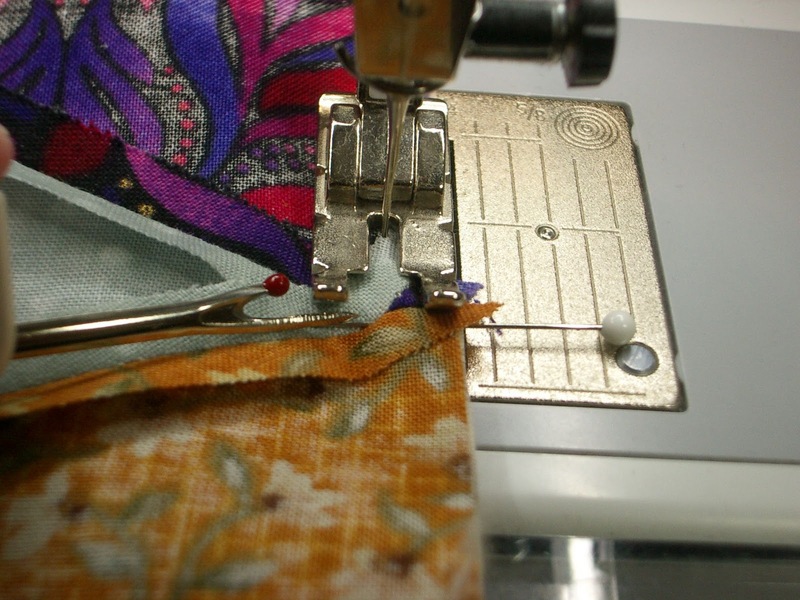 Measure and pin at the 1/4" seam allowance. 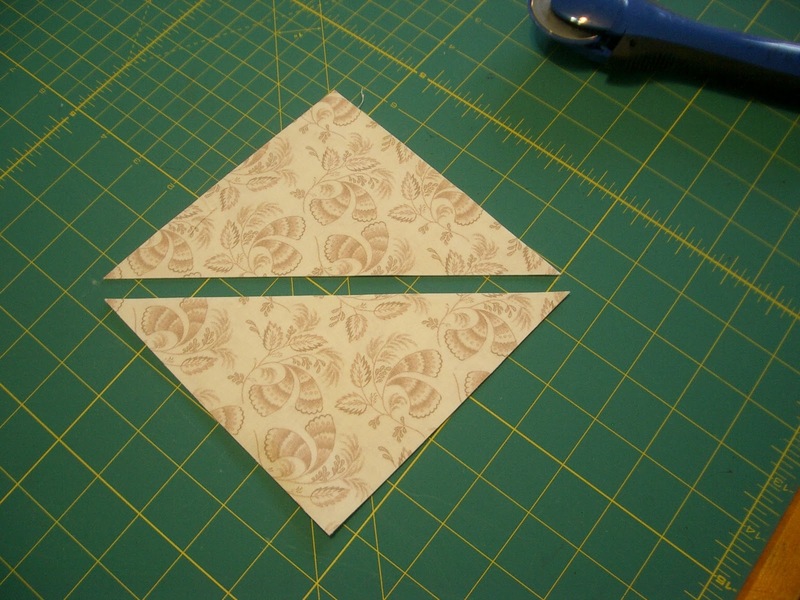 Fold the far right triangle onto the middle triangle, right sides together. Stick a pin through the first fabric layer exactly where the quarter inch seam allowances cross. 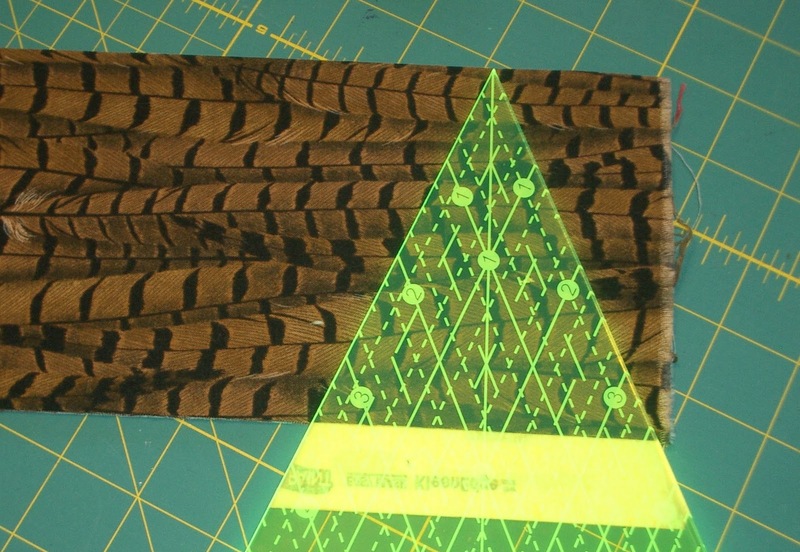 Note: A 1/4" piece of blue tape placed on your left thumb can be used to help you determine where the seam allowance line will fall. 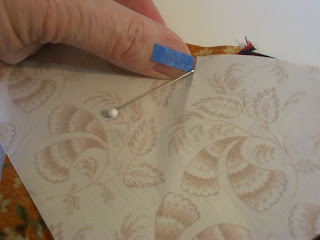 Then stick the pin point through the second layer of fabric exactly where the seam allowances cross. 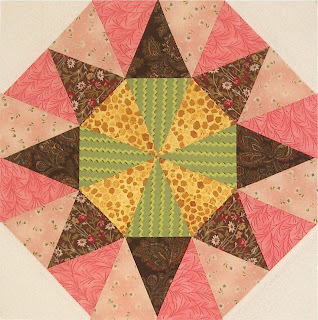 Bring the two layers together and if you wish, pin the layers together. Note that a triangle of the lower layer sticks out beyond the top later. 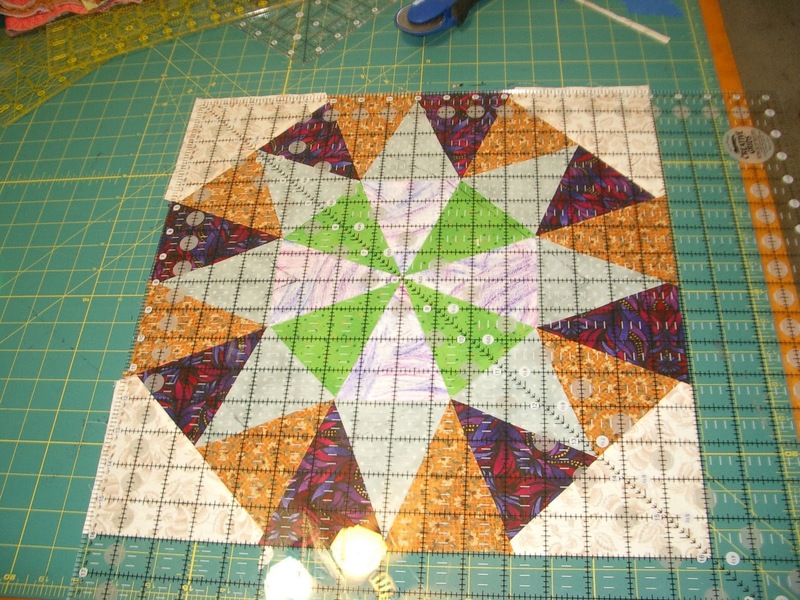 It is very important that this step be accurate, or your pieces will not go together nicely. Add the lower triangle to the set. Make 4. In a similar manner, stitch the far left triangle to the set, then add the lower triangle to complete the large triangle. Make 4 and set them aside. Cut two 6" squares of the corner fabric, then cut them in half diagonally, to yield 4 corner triangles. Add them to the layout of the 2nd group of triangles, as shown. Cut two 6" squares in half diagonally. Add corners to the layout. 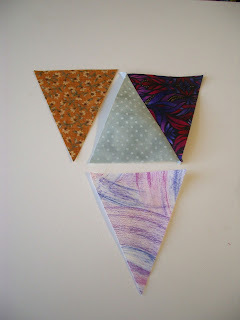 Stitch this group together in the same order as before, then center and add the corner triangles, as shown. Stitch group together in same order as before. 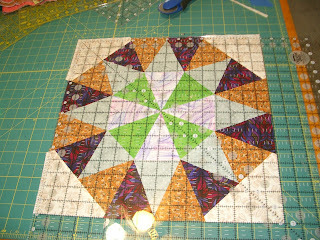 Center at stitch the corner triangles to the group. 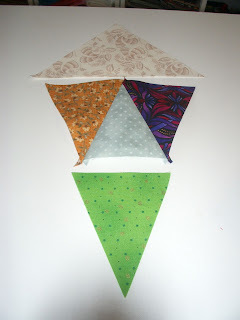 Stitch with the triangle group on top. Stitch exactly through seam intersection. 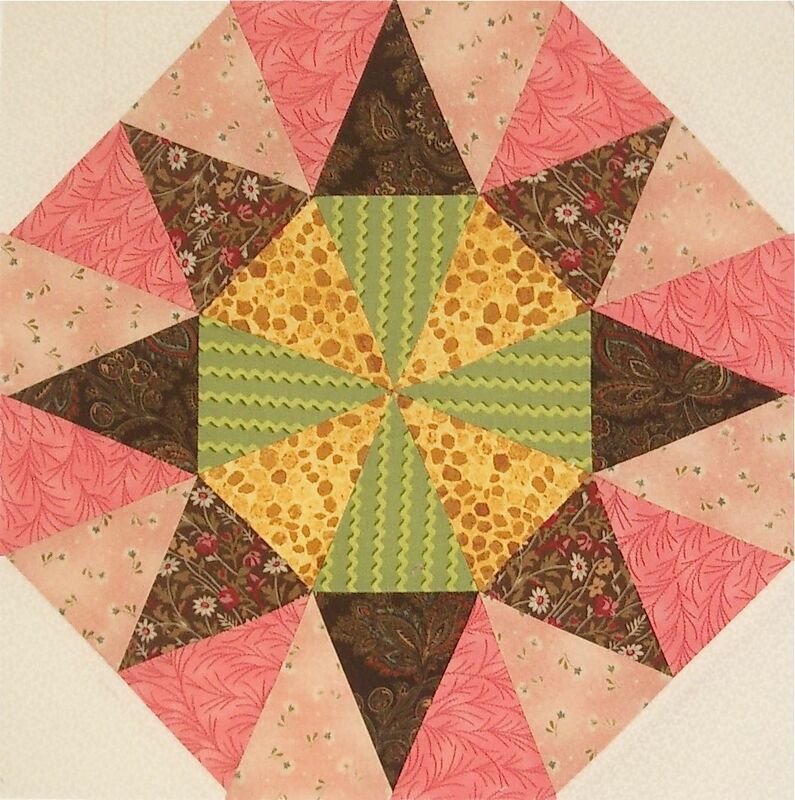 This preserves the star point. Press seams open. 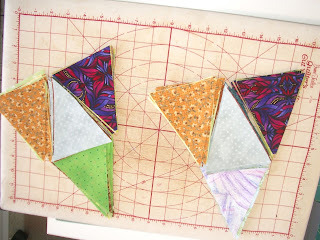 You may choose to press the corner triangle seams toward the corners, but if you will be stitching the blocks together without sashing strips between them, you will want to press the corner seams open, too. 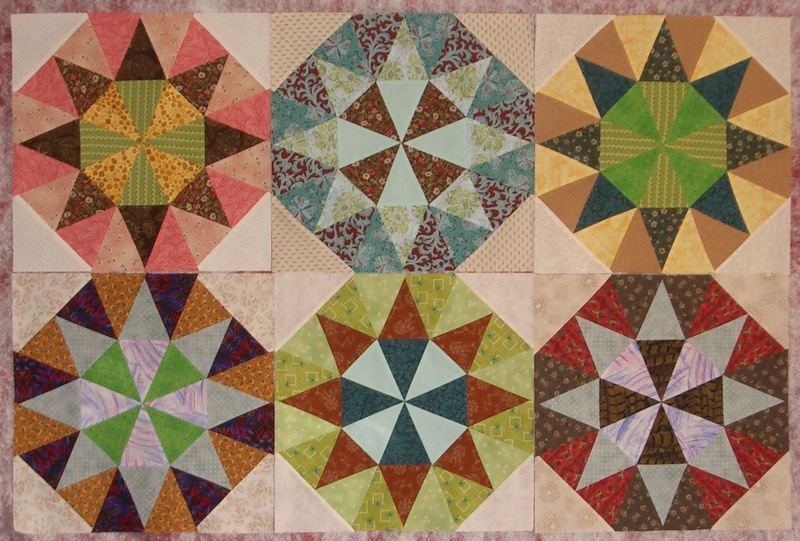 Lay out the triangle groups, alternating the corner units with the first sets, as shown. Lay out the sets, alternating with corner units. 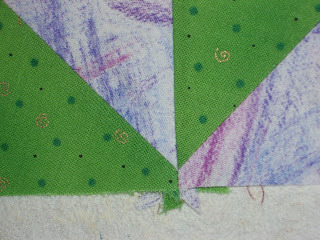 Stitch the units together into quarter blocks, as shown, carefully matching seams. 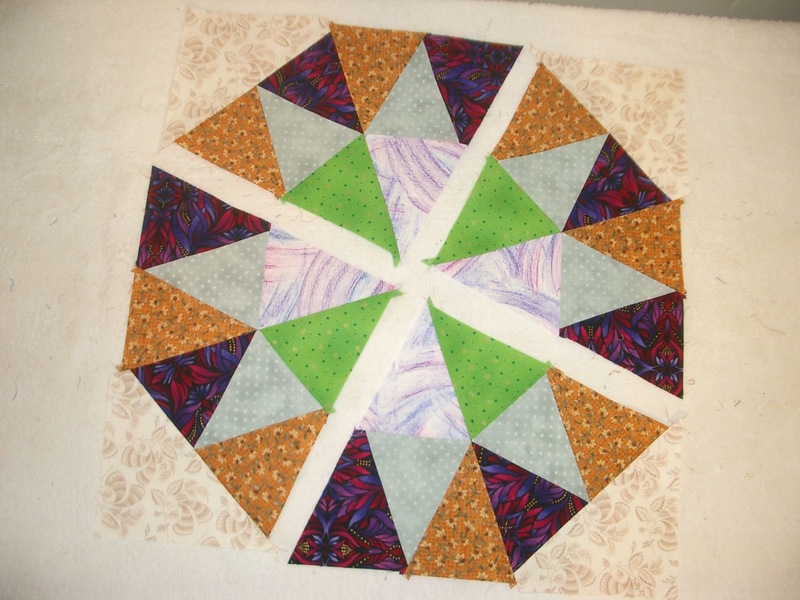 Stitch units into quarter blocks. 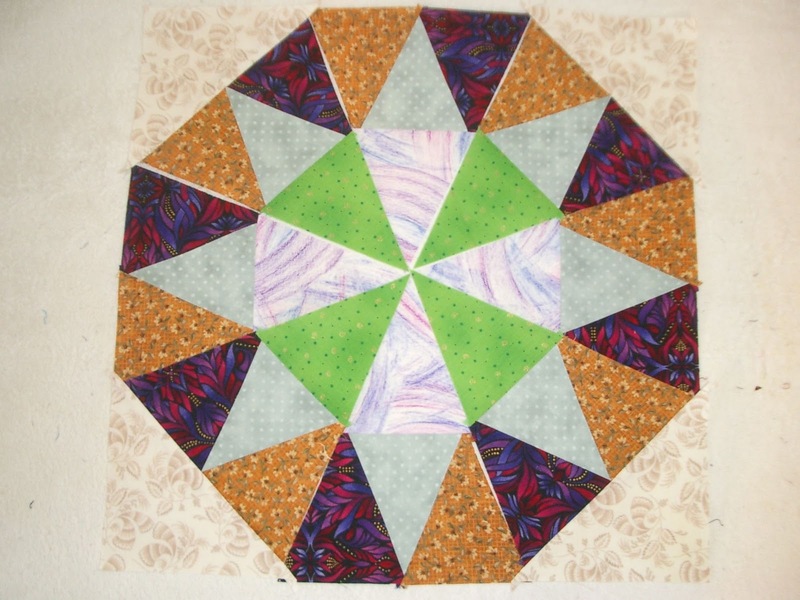 Next, stitch the quarter blocks into half blocks. Be very careful to match all seams, but especially the center seams. 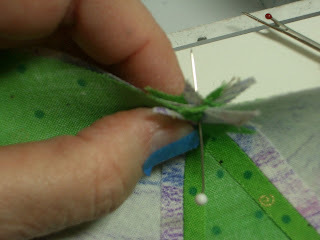 When stitched, the center seams should form a perfect 'Y'. 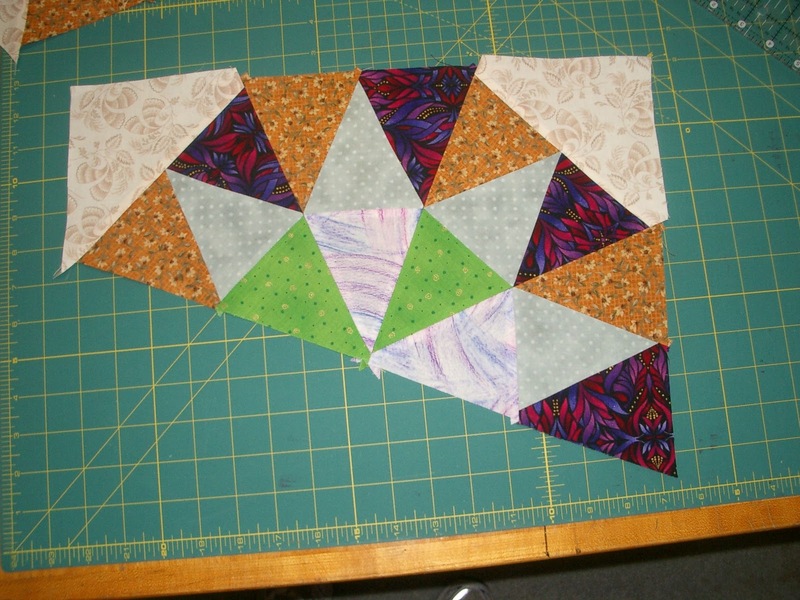 Stitch quarter blocks into half blocks. 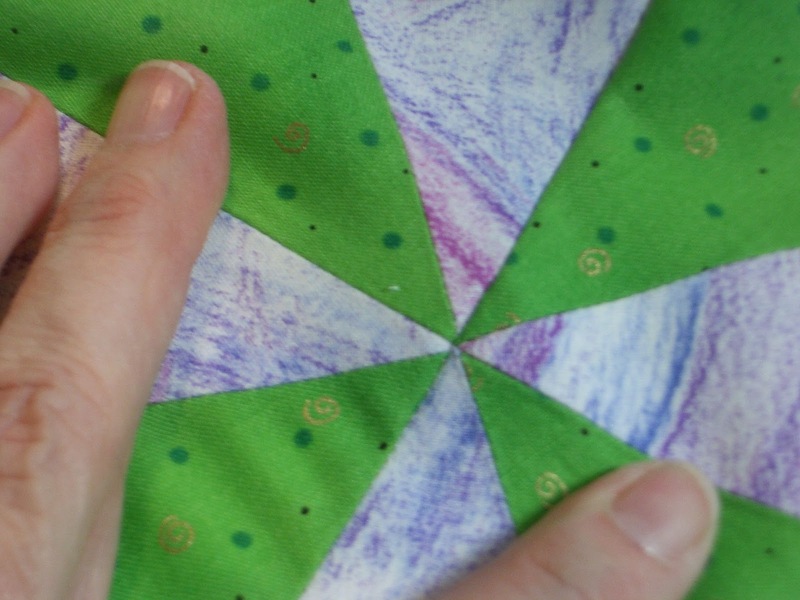 Carefully match the center seams. Center seams should make a perfect 'Y'. Half blocks will look like this. 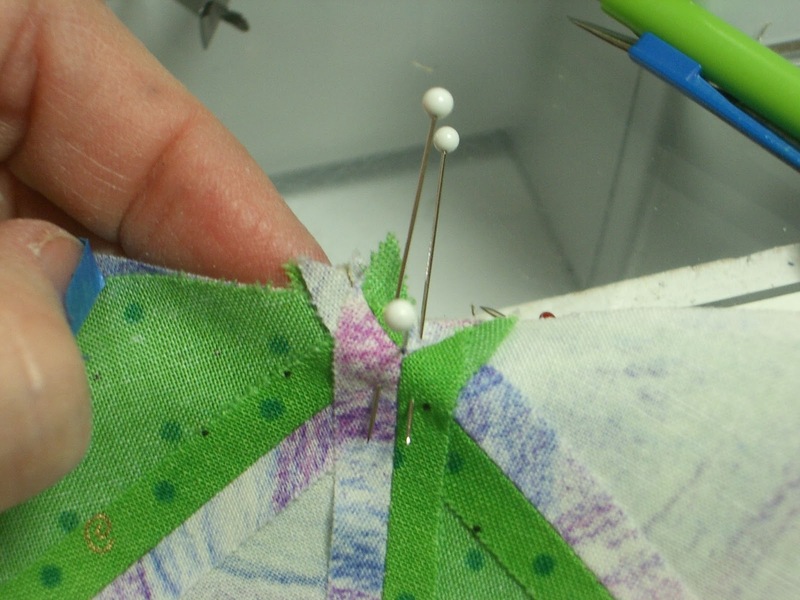 Use a single pin to match the center seams, as shown. Bring the layers together on the single pin. 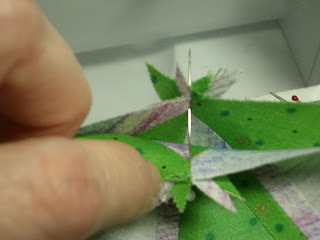 Then pin layers together on either side of the single pin. Remove the first center pin. Stitch up to the first pin. Remove it. Then stitch to the second pin before removing it. Stitching line should fall exactly at seam intersections. Aha! I did it! Perfect! 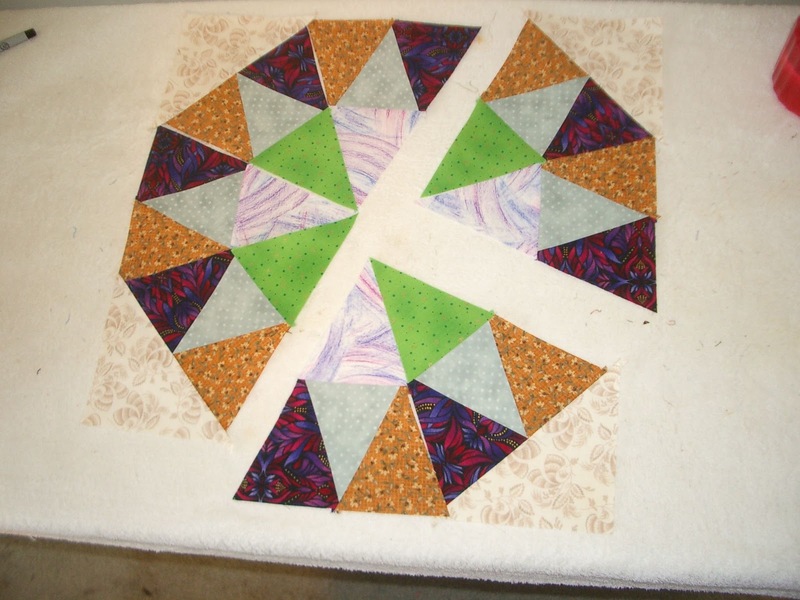 Underside of a finished block. Note: seams are pressed open. You may trim pointy pieces off at this time. trim two edges 1/4" beyond the points.